As indicated by the subtitle, this article is not about boating solo in the Broughtons. Having sailed through this island-studded wilderness in British Columbia for five weeks last summer, we would not recommend going single-handed. Numerous tidal currents, half-submerged logs, kelp beds, and isolated rocks require extra eyes. As well, the rugged beauty of its coastlines, back-dropped by verdant snow-capped mountains, is perfect for sharing with companions. 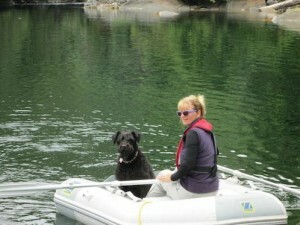 “Solo” refers to Fern’s Giant Schnauzer who accompanied us, providing ample opportunities to go ashore. Often, we had difficulty finding suitable shore access to allow her to do her business. “Wouldn’t it be nice,” we mused, “to know in advance which marinas and anchorages are dog friendly?” The obvious answer prompted us to take notes so that other boaters will know where their dogs can romp down a trail or check out an easily accessible beach. We categorized marinas and anchorages as either “dog friendly” or “not dog friendly” and arranged them in alphabetical order. To be considered friendly, a location required nearby shore access onto a dock or a beach, as well as a substantial beach, walking trail, or logging road for dogs to stretch their legs. 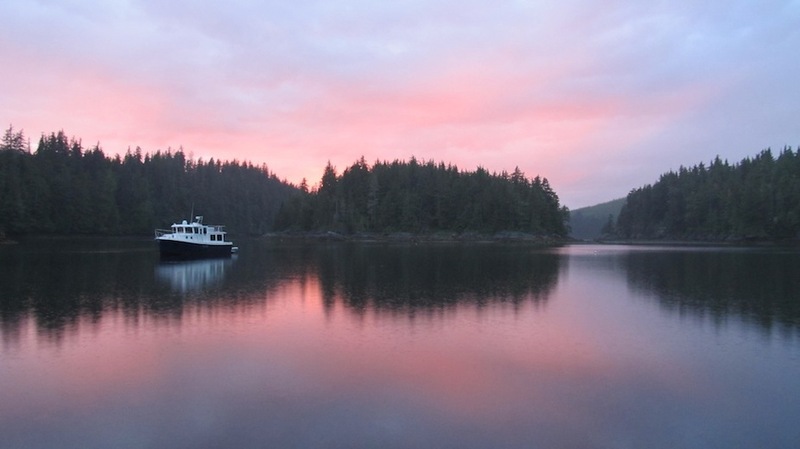 Although most of the 22 locations listed are within the Broughtons (north of Desolation Sound between Vancouver Island and the Mainland), a few are on the fringes, which we visited while boating to these islands from Powell River, British Columbia. Blind Channel Resort This full-service marina offers a map of scenic hiking trails through cedar forests, ideal for dog walking. One loop leads visitors to a gigantic 800-year old Western Red Cedar; another intersects with logging roads, which meander around West Thurlow Island. Every August, the resort owners arrange for visiting canine crew to participate with their greeter dog “Snoop” in a fun dog show. Cordero Lodge A resident dog at this small marina greeted Solo and showed her a picturesque path behind the lodge, which lead to kilometres of logging roads for adventurous travelers and their canine companions who like to explore. “Pooch” also showed her a lovely place to swim in salt water. Fortunately, water taps are available here and at most marinas in the Broughtons for rinsing dogs with fresh water to eliminate dry skin and possible itching caused by the salt water. Dent Island Lodge This luxurious marina provides a water dish, free poop bags, a scenic “Tugboat Trail” along the water, and a beach for some good old dog paddling. Two friendly canines joined Solo as we ambled along their expansive docks admiring the visiting mega-yachts. Forward Harbour A wide beach allows access to a trail over a wooded hillside to another beach at Bessborough Bay. While beach combing on the Bessborough side, Solo took a liking to a boomerang-shaped piece of driftwood. After an extended game of “fetch,” she carried her prize partway back the trail before dropping it as if to say, “I am leaving this stick for another dog to enjoy.” We carried on, vowing to someday re-visit this delightfully secluded anchorage. Greenway Sound Although this once-popular marina has been closed for years, several other boats were tied to their derelict docks. We stayed just long enough to dinghy over to another dock from which we hiked a 2-kilometre trail leading to stunningly gorgeous Lake Broughton. Here, Solo enjoyed a leisurely swim in fresh water, jumping in from a partially submerged dock for another game of “fetch.” The trail continues upward another kilometre to smaller Silver King Lake. Jennis Bay Marina This hospitable marina on the mainland has two resident dogs, “Bravo” and “Koal,” and kilometres of trails and logging roads to explore. 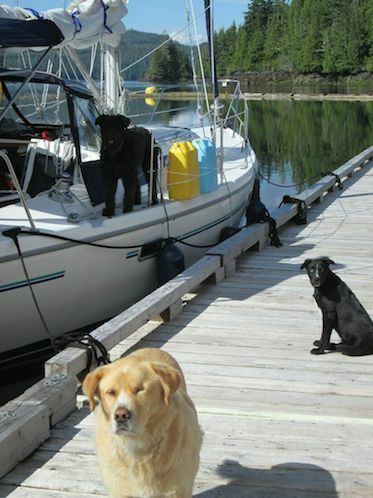 As with most marinas in the Broughtons, the operators love dogs and don’t mind if they are loose on the docks, even at Happy Hour, as long as they behave and the owners provide supervision. Here, Solo got up close and personal with a salmon caught just off the dock by a visiting boater. Kwatsi Bay Marina This small friendly marina nestled among towering granite mountains in the Great Bear Rainforest has a short walk from the top of the dock ramp to a pet potty area. By dinghy, a longer walk in the woods leads to a spectacular waterfall where Solo frolicked in the bubbly fresh water. Lagoon Cove Marina This is probably one of the best-designed marinas for dogs. At the top of the steps leading from the dock is an area for relieving pets. A map of “Pet Paths” is posted showing various trails, with distances, all leading back to the marina. 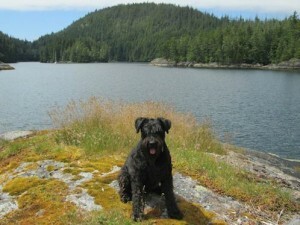 Â Solo chose the longest path to a rocky beach at the Blow Hole, the passage separating East Cracroft from Minstrel Island, where she enjoyed a refreshing swim. Port Harvey Marine Resort Extensive logging roads through the hills behind this full-service marina provide long walks for energetic crew and canines. Port McNeill Two separate full-service marinas allow ready access to a walking trail along a grassy waterfront that continues onto a dirt road. We stayed a few days at the marina nearest the fuel dock where we were greeted daily by “Stewart,” the Manager’s Yellow Lab. Prior to leaving, Solo was invited back for some fun doggie activities later in the year. Squirrel Cove On Cortes Island in Desolation Sound, numerous hiking trails are available from the marina, including a 5-kilometre trail to Von Donop Inlet in Ha’thayim Marine Provincial Park. The anchorage further in the cove has a small islet for dogs to do their business, and a reversing tidal stream that leads to a lagoon. Reportedly, a trail leads from the lagoon across the Island but we chose not to wait for a flood tide in order to access it. Sullivan Bay Marina A designated grassy “Poop Deck,” and a treat from the Manager made Solo feel welcome at this full-service marina. The mile-long docks are great for walking among the float homes, although they do not allow ready access to shore. Plans are in the works for a new separate dock accessible by dinghy and for a trail through the woods, but neither was completed at the time of our visit. Turnbull Cove An uphill, downhill trail leads to a dock at Huaskin Lake, perfect for owners and their dogs to take a refreshing dip and bask in the sunshine. Broughton Lagoon This beautiful anchorage has access to a beach, which unfortunately is too small for an extended walk. Solo made the best of it by going for a swim. Claydon Bay Although there is no trail, we scrambled a short distance through bush to a creek where Solo had a drink. Farewell Harbour This anchorage has a fishing lodge on private property, which reportedly is off limits to transient boaters during the busy season. Since no one was in residence during our visit and no other shore access was available, we allowed Solo to relieve herself on a patch of turf and take a short walk on the dock. Potts Lagoon This well-protected cove has a cluster of small float homes linked by log-boomed “sidewalks,” not suitable for dog walking; instead, we used a small islet nearby that was difficult to access from our dingy. Nearing the end of flood tide, we dinghied with the current from our anchorage into a tranquil lagoon. Although we found no shore access in the lagoon, a quiet row provided Solo an opportunity to bird watch: bald eagles and herring gulls soared overhead while blue herons and black oyster catchers stalked the shallows. We lingered just long enough to catch the ebb flow back to our anchorage. Refuge Cove This full-service marina in Desolation Sound has a designated patch of grass on shore for dogs to relieve themselves. There are no nearby trails and most of the bay is surrounded by private properties. Shawl Bay Marina This friendly marina with loads of amenities, including greeter dog “Foxy,” has just a small green area for dogs, which Solo refused to use. She preferred an old log dump, which we accessed by dinghy. Sutherland Bay Rocky beaches are not suitable for walking; however, if your dog can handle a 15-minute dingy ride, many kilometres of old logging roads are available. Waddington Bay This beautiful anchorage was our biggest disappointment for Solo. What looked like beach turned out to be mostly mud, while a small islet was only accessible at high tide. The good news for those who boat in the Broughtons with their canine companions is that most of the marinas we visited (9 out of 11) are dog friendly. The bad news for those who prefer the serenity of a quiet anchorage, is that most of them are not dog friendly (7 out of 11). At high tide, the sea goes right up to the trees so there is very little shore access. At lower tides, the shore is beset with barnacles and oysters, which were hard on our soft-bottom dinghy as well as on Solo’s paws. If you boat in the Broughtons with your dog, be aware that this area is primarily wilderness, home to bears, cougars, and coyotes, so it may be prudent to keep your dog within view and under control when going ashore. And two final caveats: First, we only reported on a limited number of marinas and anchorages during our cruise; many more could have been included if we had had more time. Second, our classification of locations as dog friendly was based on our experience in the summer of 2013. Since that time, changes may have been made, especially at marinas, to ensure that boaters with canine crew will be more likely to enjoy this increasingly popular cruising destination.